Remodeling offers homeowners the opportunity to get that dream kitchen, bathroom, master suite or deck without the hassle of buying a new home. However, it’s not as easy as just knocking down that wall to open up the main floor, or re-doing the master bathroom. Each city has different rules, regulations and processes for home remodeling projects, and this series is intended to help anyone interested in improving their home to understand the scope of what needs to be done. Check out previous installments to learn more about permits and inspections needed for home remodeling projects. 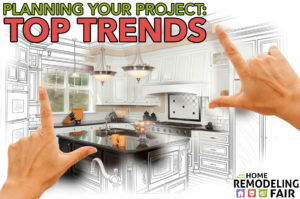 In this installment, the City of Minnetonka’s planning department shares current home remodeling trends in Minnetonka and the West Metro area. Improving bathrooms – particularly master baths – is an ongoing trend, including updates to cabinets and vanities, faucets, shower heads, lighting fixtures, walls and trim, fans and – of course – toilets. Kitchen updates are another common remodeling project that goes far beyond new appliances and cabinets. Updating countertops, backsplashes, walls and trim are certainly in, along with adding an island or adding more cabinet and counter space. Gone are the days of closed-off, separate rooms for eating, cooking and dining. Open concepts are all the rage, and Minnetonka and the West Metro are no different. Many remodeling projects focus on tearing walls down, opening things up and improving flow throughout the main level. Some homeowners are going beyond updating their current structure, and adding accessory structures to their property. New detached garages are an emerging trend, to provide homeowners with extra storage, extra covered parking and extra workspace. Especially in Minnesota, heat and electric are must-haves to make these structures fully functional year-round. The old phrase, “Don’t judge a book by its cover,” doesn’t apply to homes. Renovation projects now commonly involve adding features to the home’s entryway – both inside and outside. Not only could updates in this area make the entrance more grand and inviting, but they could also go a long way to upping the curb appeal and resale value. Adding to the exterior of the entryway can give an older home a fresh look and a new focal point. For more tips and advice on inspections, visit the West Metro Home Remodeling Fair on Sunday, Feb. 11, from 10:30 a.m. to 3 p.m. at the Eisenhower Community Center (1001 Highway 7) in Hopkins, Minn. City inspectors will be on-hand to answer questions about inspections, permits and other project requirements. The fair also features a wide variety of exhibitors with products and services related to home improvement, including remodeling contractors, architects, landscapers, financial lenders and more. Learn more at homeremodelingfair.com.